©2002 paulf. All rights reserved. 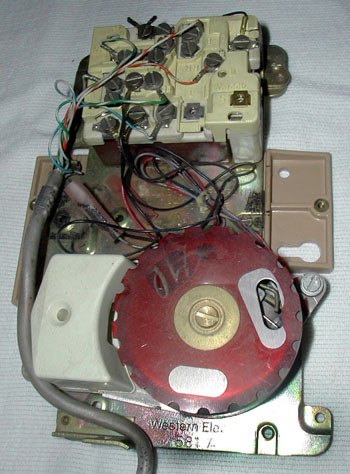 The 581A consists of a metal plate with a 4010B or 4228 network and P1A ringer. Dial, transmitter, receiver, ringer and line are connected to the network. If mounted externally, a 6 conductor mounting cord is required. This one is dated 1/77. At the time of manufacture, the customer could own the housing, but not the internal active components. These were provided by the phone company as part of the monthly service. 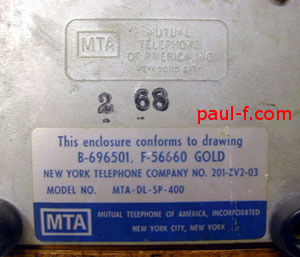 Non-Bell companies designed phones to accommodate the components of the 581A. 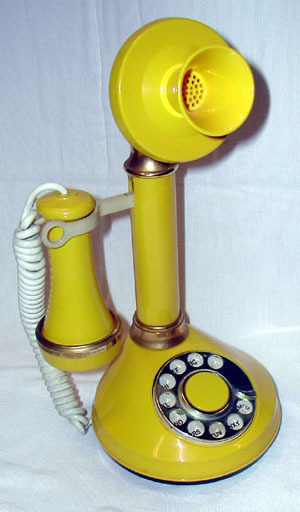 Here, the 581A is installed with a Deco Tel Candlestick telephone. The 581A is in the external "subset." They were also used with cradle phones and other custom-designed phones -- usually integrated into the main body of the phone (see below). Please send photos of other applications, and I'll post them on this page. Phones were provided with no internal active components. In this case, they even provided a non-functional "dummy" dial, so the phone could be displayed in place until the installer arrived. Labels on subset (above) and set (below), provided details and directed the customer to arrange for the installation of Bell System active components. At installation, the Bell System installer put in the receiver and transmitter elements, dial and 581A -- then tested the phone. 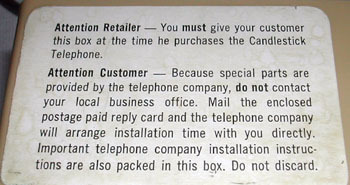 If service was discontinued, the phone company had the option to remove the Bell System components. 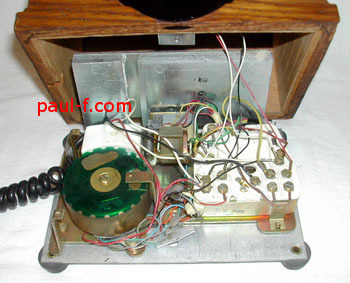 In non-Bell areas, similar arrangements were made with the local phone companies, who would typically use AE/GTE or Stromberg components. Curiously, 503-100-120 is out of numeric order in Station Service Manuals dated 7/71 and 10/72. It seems to be in the place occupied by 501-410-400 in previous SSMs, near the beginning of Section 502. In SSMs after 1972, it is sorted after section 502. DecoTel Candlesticks were sold by the Bell System as part of the Design Line Series starting in about 1974. 503-200-109, I1, 12/74 shows sets in black, red, white and "stars & stripes." Networks and ringers were packaged in the base of the phone, so an external subset was not needed. 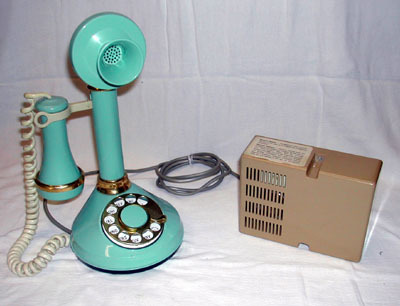 The phone shown above was dated 1/77, and probably used the 581A because it was aqua -- not a standard Bell System color, and was probably purchased through mail order or from a non-Bell store. Internals for customer-supplied housing and handset. F-56659 included a dial with silver fingerwheel and card holder. F-56660 included a dial with gold fingerwheel and card holder. Metal plate with a 4010A network and P1A ringer. 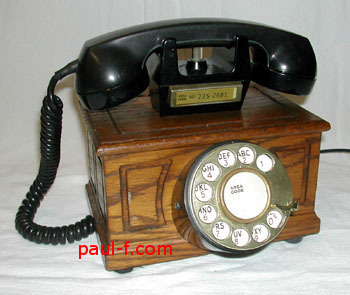 Mounted in a third-party supplied telephone. The phone is dated 2/68. The metal plate is marked F-56659/60, as the same subassembly was used for either kit. The dial fingerwheel and card holder color is the only difference. Before the Design Line series, phones were tested and approved by the operating companies. This one was tested by New York Telephone. Appendix 2, 501-410-101NY, Issue A, 10/66, N.Y. Tel. Co. The bottom label shows conformance to Bell System specs. Mutual Telephone of America, Inc.
©2006 paulf. All rights reserved.